Rae Gleeson the excited owner of Ruby Guru is pictured in the winner''s circle at Clifford Park with her mare, strapper Nick from the Michael Nolan stable and jockey Dale Smith. 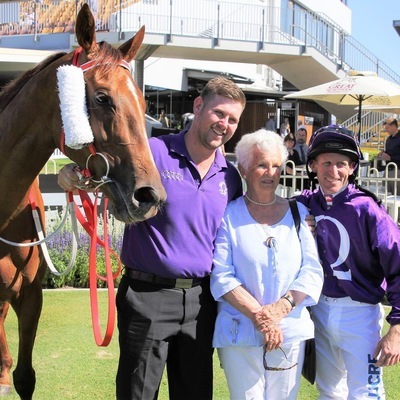 Clifford Park may not be Randwick and the winner of the KR Plumbing Benchmark 50 on Weetwood Day might not be in the league of Winx, but the win of Ruby Guru last Saturday was equally as excited for Stanthorpe owner Rae Gleeson. The five year old mare was bred in NZ at White Robe Lodge by Brian Anderton. The NZ racing Hall of Fame breeder and trainer sent the mare to his long time friend Neil “Ginger” Gleeson and his wife Rae to race as a three year old in 2016. Unfortunately Ginger who loved his racing and especially Ruby Guru passed away 18 months ago. When I spoke to Rae on Tuesday morning (which incidentally would have been Ginger’s birthday) she was still excited that Ruby Guru, “Ginger’s girl” had won on the biggest day on the Toowoomba racing calendar. The mare who is still registered jointly in Neil and Rae’s names has won races previously but this was her biggest win. Rae said that she had not been over confident before the race but Michael Nolan who trains the horse in Toowoomba expected the mare who started at $12 to run well. The entire Gleeson family, including children Mary-Jane, Jamie, Michael and Rachael who made the trip from Biloela were on deck to cheer the mare home. No doubt Ginger was also watching the race unfold and perhaps there was a heavenly hand in the win.